With the deadline quickly approaching, I have a renewed sense of urgency. I would ideally like to be done before Thanksgiving. Last year I barely finished 2 days before the deadline. While I loved what I was doing, I felt like it was a dark shadow over my favorite time of year. I just wasn’t able to fully enjoy things. Working on my flower shop I felt guilty that I wasn’t doing things for the holidays (which I love). And when I was doing stuff for the holidays I was slightly panicked that I wasn’t going to finish in time. My to do list is mostly the unfun things, time consuming tasks, or things I’m stuck on. I have to finish the back part of the structure (log supports), finish the top of the tent (tarp, tie down ropes), finish the second chair I was working on (hardware, making the seat), landscaping, making and installing the lights, and putting everything into place. Each of those things has multiple steps and I’m sure there are 10 other things I’m forgetting. The more I talk about it the more I start to panic and who really needs sleep anyways? Ok, back to the main reason I’m posting today. Many years ago my husband and I went on a safari vacation in Kenya. 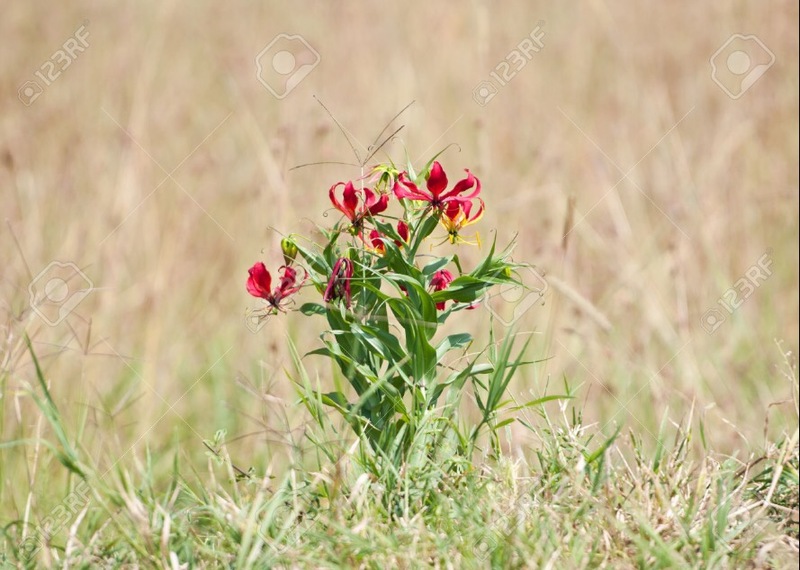 One morning, when our tour guide was driving into the park, I noticed by the side of the road a clump of gloriosa lilies. I squealed. I was working at as an event florist in DC. I had never really given much thought to the flowers we used in our arrangemets, so to see one in the wild was pretty neat. 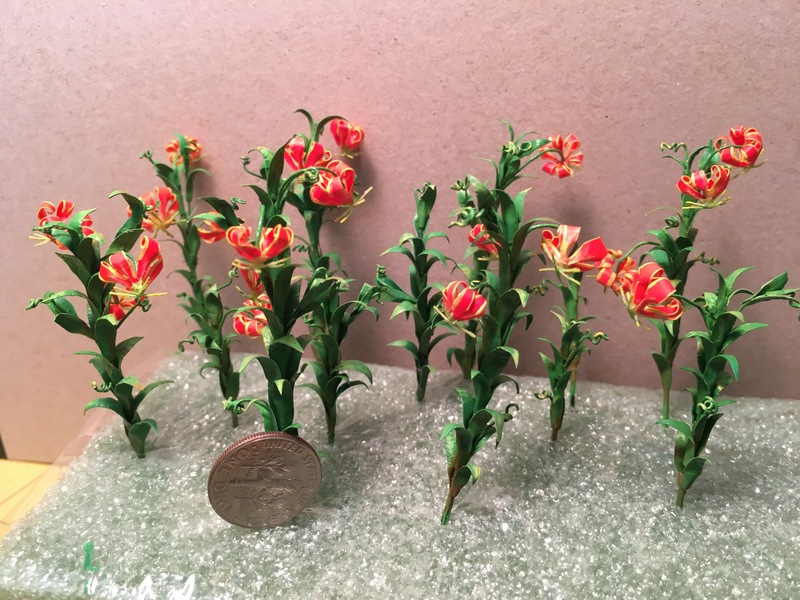 When I had decided on the theme for this build I knew I had to include gloriosa lilies. This is one of the pictures I used for reference when creating my own miniature version. The petals and leaves are made from 2 sheets of origami paper that were glued wrong sides together. The petal and leaf shapes were just eyeballed. Nothing in nature is perfect, so I wasn’t too concerned about the flowers being perfect either. The yellow was painted on the edges of the petals. The petals and leaves were shaped using my handy pink eraser, tweezers, and ball stylus. 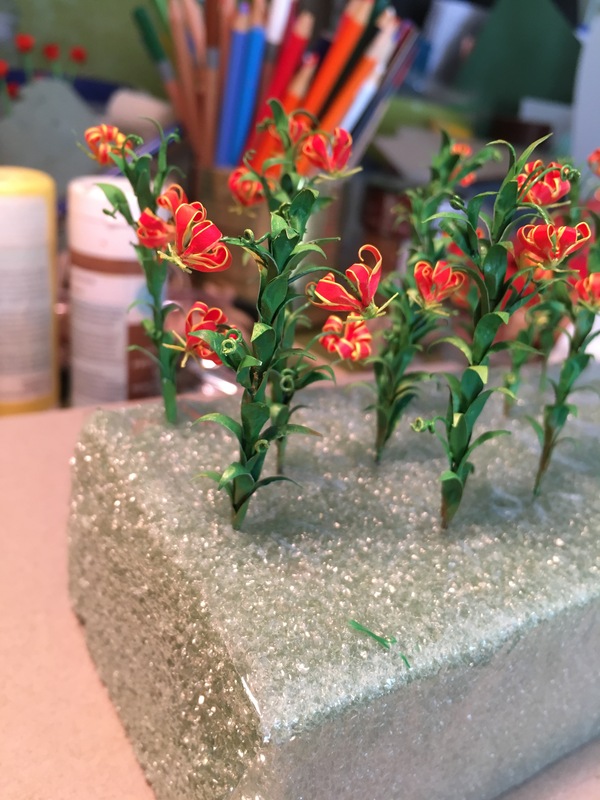 The petals were glued to wire that was painted green. The leaves were glued to thicker wire that was also painted green. Little tendrils made from wire were added to the main plant stem. After all of glue was mostly dry, the paint was touched up and some veriations in color were also added to the leaves. 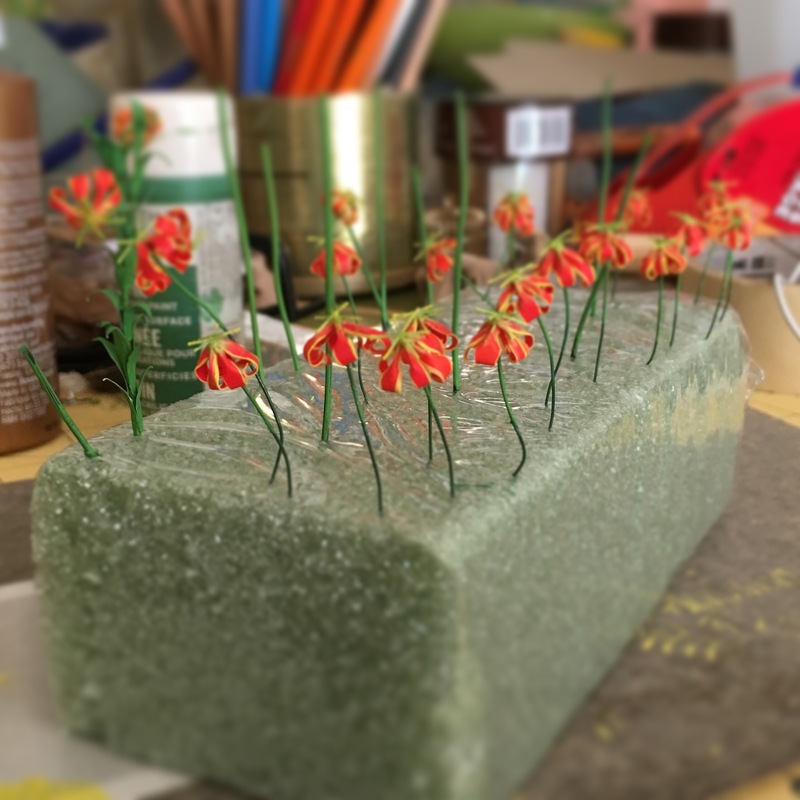 Lastly the flowers were glued in place. After all of the glue dries for a couple of days, I plan on adjusting some of the plants. Bending wires, fluffing out the leaves a bit more, just trying to get them to look a bit more fancy and natural. My version is probably not true 1:12 scale. The flowers are a little bigger than your average gloriosa lily. I prefer to think that they are really well fertilized and therefore big and beautiful. These took many, many hours over a 3 day period. I’m sure I could have gotten them done in one day if I completely ignored my real life, however my kids don’t seem to appreciate a free range lifestyle. Oh well. My next project will either be finishing my second chair or finally tackling the support beams for the back of the tent. 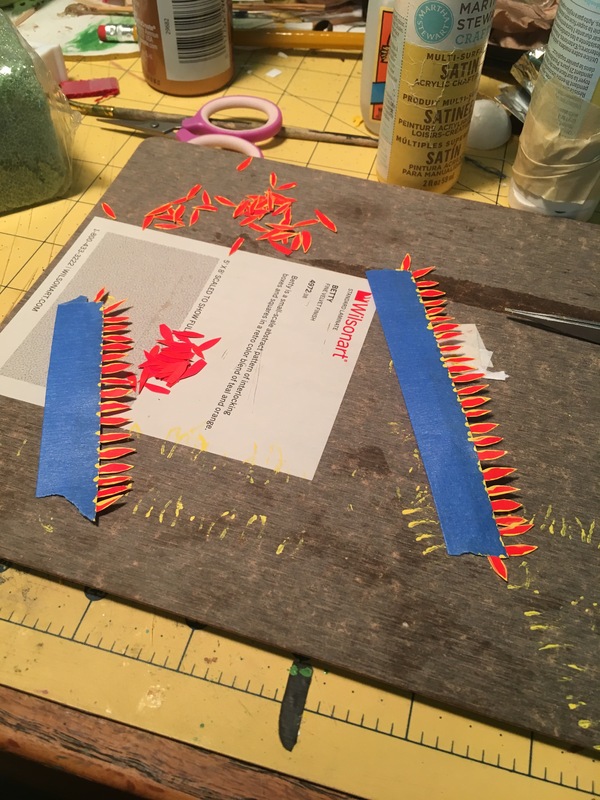 Either way the next project will be very messy and dusty, which is why I’ve been avoiding them. I’ll just have to embrace the mess and get it done! Wow! Those are (appropriately) glorious! So pretty and full and green! Love them. Can’t wait to see them in your landscape around the tent! Thanks! I’m slightly more excited to get the landscaping started now, lol. Oh, and give yourself a break on the deadline thing. You’ve gotten so much done you’ll be all finished before you know it. It’s just those things that bother you that seem to take forever. True! I just need to dive in and get them done! I ABSOLUTELY ADORE your Lilies- they are truly GLORIOUS! And I love that you have been able to incorporated something from a Real Life past experience of yours and turned it into a significant part of your current mini build- Fantastic! I feel pretty sure that your Beautiful flowers will also be attractive to the butterflies, so perhaps your explorer won’t need to go too far afield in order to observe them! Thanks! I do have a few butterflies left over from the jars I made. I had thought about putting one or two on the lilies. awesome! they look absolutely perfect! Oooh! I can understand why you squealed. Your mini versions are marvelous!